Introduction to Team Building Techniques helps increase motivation, promote unity, strengthen corporate and team culture by using proven team building activities. Elizabeth Best Management Books - from Team Effective Focused, practical information for managers. Current titles include: * Effective Management Skills * Effective Communication * New Manager Training * Time Management * Getting Organized * Leadership & Motivation * Human Resource & Teams * ... more, Click Here! Stephen R. Covey's 7 Habits at FranklinCovey.ca. By examining scores for 6 indicators of excellence, team members can identify areas of strength and weakness, discover overall patterns of agreement, and surface differences in perceptions about how the team is functioning. Benchmarks of Team Excellence was developed as part of an extensive research project that investigated the relationship between various leadership behaviors (visionary leadership behaviors and good management practices) and the level of excellence in the manager's team. A thorough review and synthesis of the literature revealed 6 indicators of excellent work units: alignment, team effectiveness, empowerment, passion, commitment, and results. The 6 indicators of excellence: 1. Alignment — a deep sense of vision or purpose that is shared among team members. 2. Team effectiveness — strong internal processes that allow coordinated efforts, such as shared values, trust, open communication, flexibility, and decision making. 3. Empowerment — feeling empowered to do what is necessary; personal and collective power. 4. Passion — high and sustained levels of energy, enthusiasm, excitement, and confidence. 5. Commitment — deep commitment to the purpose of the team and to each other. 6. Results — accomplishing outstanding results based on high standards. By combining individual scores with the team’s scores, participants get a portrait of their team’s overall level of performance in each of the 6 excellence indicators. Interpretative information provides insight into the ranges and scores. With analysis, discussion, and action planning questions, participants then reflect on and discuss the team’s functioning and how it can improve. Lack of commitment. Stress. Burnout. If your organization is like many today, you’re all too familiar with these barriers to success. But that’s what happens when there’s pressure to meet ever-increasing expectations with diminishing resources. Yet as a trainer, you know that organizations that embrace accountability, retention, and morale flourish. That’s because employees who are accountable are better able to negotiate clear agreements, build stronger relationships, and feel more in control of outcomes—all of which results in less stress and more productivity. The Accountability Experience is a comprehensive learning solution that combines a self assessment and a one-day workshop to give employees the skills, tools, and strategies they need to strengthen their commitment to accountability. The result for the organization is individuals who are able to do things more effectively with less stress, feel a sense of accomplishment, develop more positive relationships, and improve personal productivity. Learning Objectives: Understand the benefits of an accountable environment. Define responsibility, empowerment, and accountability. Discover one’s personal skill levels. Recognize barriers to accountability. Identify appropriate tools to address accountability challenges. Practice skills associated with declining, negotiating, and holding others accountable.Develop a plan to enhance on-the-job accountability. Administered in advance of the workshop, the 73-item self assessment measures an individual’s mindset in four dimensions of accountability: Personal Responsibility, Personal Accountability, Team Empowerment, and Perception of Organizational Culture. The Accountability Experience is appropriate for individuals, supervisors, managers, and directors in any industry, including the public sector. It’s also helpful as a refresher course for senior executives. Linda Galindo consults with organizations, teams, and individuals who aim to improve their work and personal lives through greater personal accountability. She is a keynote speaker and conducts executive-level seminars and retreats. She has been a regular contributor to Connect magazine and Lab Medicine. Galindo is experienced in change management, accountability, leadership development, and cultural assessment. The term team building refers to the selection, development, and motivation of result-oriented teams. Team building is pursued with a variety of practices, such as group self-assessment and group-dynamic games, and generally sits within the theory and practice of organizational development. formula for success. In today’s streamlined organizations, project management is no longer the just domain of the specialist. Now just about everyone is required to play the project manager role. At the same time, this growing need doesn’t necessarily require certifications, Gantt charts, or the Critical Path Method. Instead, what’s really needed is a basic, solid skill set that can be applied to everyday work. What makes Rocket such an effective learning experience is the combination of an actual hands-on team challenge and Russell’s four-step Dare to Properly Manage Resources model. Through game play, participants learn very quickly the importance of each phase, from planning to completion as well as the need to practice what’s referred to as flexible structure. 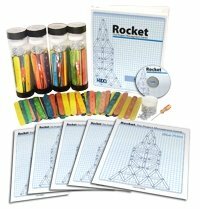 At the heart of the game is a construction project – you guess it, a rocket! Project teams are faced with the challenge of building to exact specifications, given only limited knowledge and resources – and they’re expected to complete the project both on budget and on time. While on the surface, it may seem like a somewhat simple task, tension and pressure grow as information is revealed and team dynamics emerge. Lou Russell is president and CEO of Russell Martin & Associates. She is the author of The Accelerated Learning Fieldbook, Project Management for Trainers, IT Leadership Alchemy, Leadership Training, and 10 Steps to Successful Project Management. She is a frequent contributor to Computer World, Cutter Executive Reports, and Network World, among others, and publishes the monthly Learning Flash electronic newsletter. A popular speaker, Lou addresses national and international conferences such as the Project Management Institute, Project World, and LotuSphere. She holds a computer science degree from Purdue University, where she taught database and programming classes, and a Masters in Instructional Technology from Indiana University.